So, where’s your favorite Chinese restaurant? And tell me: what’s so great about it? Their homemade noodles make Judy Fu’s the best reason to eat there or even better have it delivered. Other reasons to not skip this place is the tender bbq pork and the pork filled won tons in a spicy peanut sauce. Another place that makes their own noodles. The pork in the pot stickers is juicy and flavorful. Everything is deliciously seasoned on a plate of chow mien is piled high with fresh noodles, veggies and your choice of meat. Another bonus is not only will you leave full and satisfied, but it will probably cost you less than it cost you to drive there. Yae’s Wok this Newcastle institution is almost always packed and serves us some of the best Chinese in the area. I find that the service can lack a bit mostly because they are so busy and takeout’s can get pushed to the very back burner. The food however, is second to none. Little Peking in Renton – while this place seems to go rather unnoticed and is rarely full, it has the best Chinese food in the county (I think). You won’t find any Cantonese around these parts! My fav’s are the Mongolian Beef, BBQ’d Pork Fried Rice, and the Almond Chicken. Flavorful, spicy, and delicious. AND food is usually ready within 10-15 minutes, takeouts welcome. I have to give it up for my favorite: Johnny’s Wok in Edmonds. (Ok, the address is Lynnwood, but acroos the street is Edmonds. They give you SO MUCH FOOD!! And it’s awesome. The Lemon Chicken is crisp on the outside, moist on the inside. The General Tso’s chicken pieces are huge, not some marble size piece of dried meat with too much sauce. The Jumbo Prawns are fantastic. Ok, I’m getting hungry, i better stop there. Anyway, It’s hard to find. It’s in the back of a business strip near 196th & 76th. If you find Subway, it’s just around the next driveway. They also have delivery. We have also used them for a take out family party and the platters were huge and very reasonable. Two of my favorites have already been mentioned…Hing Loon in the ID being one of them. At Hing Loon I always get the Salt & Pepper Pork Chops and the Black Bean Chow Funn. As already noted, Yea’s Wok in Newcastle is another winner…don’t let the strip-mall digs scare you away! Standout dishes at Yea’s include the Camphor-Smoked Duck and plump Fried Oysters that you dunk alternately in salt/pepper and ketchup. Another Eastside place I like is Jeem, on the edge of Bellevue and Redmond at 14850 NE 24th Street, Redmond, WA. It’s great for weekend dim sum. These three places are all very easy on the wallet, with it being easy to have a feast for only $10-13 per person. When it’s available, you have to try the smelt at Tai Tung (check the wall for a posting). The restaurant and the staff are almost the same as I saw growing up, so anything there is great comfort food, but since it’s difficult to fry anything at home without smelling it for days, let the chefs at Tai Tung do it for you! And of course, any of the barbeque items at Kau Kau (across the street from Tai Tung) are first rate. Just add some steamed rice to a pound or two of bbq pork and you’ve got a great meal. We love Taster’s Wok in Lynnwood (previously in Edmonds). The family fav is the General’s chicken; I also love their Chinese Chicken Salad. Very friendly staff also! The ssum ssu at Kau Kau. I used to live in Newcastle and didn’t realize what a treasure Yae’s Wok was until I moved away! My other fave that hasn’t been mentioned is Szechuan Bistro, on 85th and Greenwood. 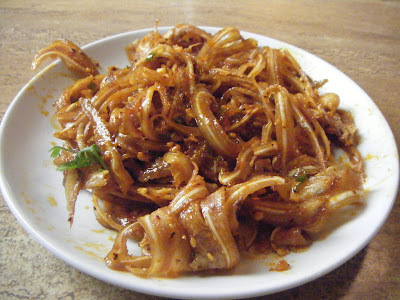 The dried string bean with fried tofu is wonderfully spicy, the tofu fried golden brown and crispy on the outside. I also love the hand-shaved noodles there. If you’re willing to head south to Tacoma check out Tacoma Szechuan on South Tacoma Way. My brother (who has lived in China) claims it’s the most authentic Chinese he’s eaten in Washington. We like the friendly Chef at Wok up north on Greenwood ave, at 125th. While the food is more Americanized Chinese than pure, it’s tasty fresh and fast. They deliver too. 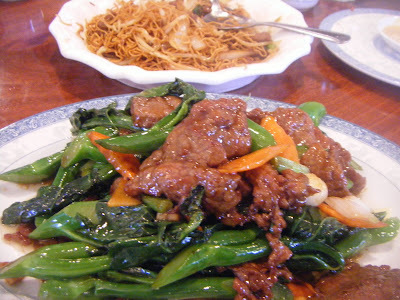 We also like Szchuan Bistro, on N. 85th at. just west of Greenwood. Great deals at lunch, try the yu xiang chie zi (eggplant ‘fish style”) or the ants on a tree. It’s walking distance from our house, bonus. If you like Little Peking in Renton (and I do), you’ll also like my favorite: Han’s Garden on Mercer Island. Roger and Lily, who used to run Little Peking, are now serving up Mongolian lamb, sesame mushroom strips, and pages of other rare finds at Han’s Garden. For folks who like more traditional Chinese, they also have the best hot & sour soup and honey-walnut prawns around; I can hardly bear to eat anyone else’s after tasting theirs! Hey, Elizabeth! Did you mean to say SHANGHAI Garden for the barleygreen hand-shaven noodles, which I also love? Bet you did. They’re also available at the Shanghai Garden in Issaquah, and, I believe, at the sister-branch in Factoria. you know about top gun in factoria? the dim sum is crazy good. in the city, though, how can you deny tai tung? their geoduck has that special snap. My family also loves T&T Seafood up in the North End. Shanghai Garden for their shaved noodles. Kau Kau for their BBQ Pork and Side Pork . . . and anything else hanging in their window. Jade Garden for dim sum. our family frequented king wha in burien back in the days. absolutely the best chinese food. does anyone know if it’s still there? Does downtown Seattle have any great Chinese take-out places? Szechuan 99 is very good. There’s a restaurant that serves similar food in Greenwood which is closer to where I live that I also enjoy very much; Szechuan Bistro, much love. Ditto Sichuanese Cuisine down in the ID. Chiang’s Gourmet in Lake City is a little pricier than most Chinese places I typically eat at but the quality of the ingredients and preparation is fantastic. The food there is great and they serve a wide variety of Northern, Shanghai and Sichuan dishes. If my girlfriend were not a religious vegetarian my blood pressure and body fat percentage would increase dramatically as a result of constantly eating greasy, spicy Chinese food.